Commissioning, qualification, first, second and third phases of validation, their documentation and sampling schedule in purified water system validation. Water system validation (generation and distribution) should contain three phases: Phase I: investigation phase; Phase II: short-term control; and Phase III: long-term control. The objective of pharmaceutical water system validation during these three phases should demonstrate that water system is under control and producing the specified quality of water over a long time period. Proper documentation of commissioning is an essential part of the successful validation of pharmaceutical water system. Commissioning includes the startup of the water system with documenting the performance of all system parameters. Water sampling and testing should be done for 2 to 4 weeks to monitor the water system. During this phase, water system should operate continuously without failure. Following things should be considered during this phase. • Sampling and testing of the raw water i.e. feed water should be done to monitor its quality. • Sampling after each step should be done daily. • Chemical and microbiological testing should be done as per the approved specification. • Operating, cleaning, sanitizing and maintenance procedures should be finalized during this phase. • Ensure the production of the required quantity of water. • Alert and action limits should be verified after this phase. A 2 to 4 week testing should be done again in phase II to monitor the water system intensively. Sampling frequency shall remain as per the previous phase. 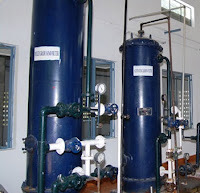 Water can be used for manufacturing during this phase of water validation. The demonstration should be done that the water system is producing the required quality and quantity of water while operated according to the relevant SOP. After the successful completion of phase II, phase III runs for one year. We can use water for manufacturing during this phase. • The frequency of sampling and testing should be reduced in this phase after successful completion of phase I&II. • Seasonal variations are observed in this phase of validation i.e. seasonal trending shall be done. on which time we can conduct the hold time study of water in our water system?? if their is any power failure or any other incidents, how we can conduct the hold time study?? IS it before or after of water system validation?? can you suggest guideline or SOP to handle this operation? Regular check on Physical chemical Parameters & Microbial Load. Including Conductivity..... 12 sampling points are monitoring on regular based. regular Cleaning Schedule follow with chemical sanitizing agent. Specification have IP BP USP with 1.3. I have to maintain alert and action limit....for conductivity..
so I need your suggestion. m last five year working with Five RO Water system and one Ultrafiltration System. Before starting phase-I, you should perform Challenging test for Auto dump valves and hold time study. During the phase-I validation drain time study also to be done.